...hugs you snugly, like Catwoman’s jumpsuit. Wearing Cuir Cordoba by Keiko Mecheri is like slipping into a warm bath on a cold night: ahhhhhhh…..mmmmmm…..siiiiiiiighhhhh. This fruity leather enfolds you in rich, buttery softness, and sustains you against life’s harshness. Cuir Cordoba is a “wherever you are, you are there” perfume, with no beginning, middle or end. Just one spray and you’re in the thick of it: fruity-floral violet, powdery benzoin, “intimately unwashed” hawthorn flower, resinous elemi, sweet-sour cedar wood. 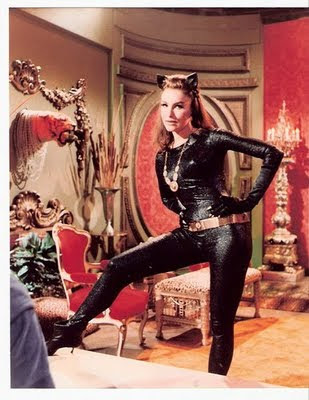 This eau de parfum hugs you snugly, like Catwoman’s jumpsuit. But Daim Blond emphasizes its leather with almost-sharp, latex accent, which Cuir Cordoba doesn’t possess. The latex gives DB a fresh “snap”, in contrast to CC’s nuzzly downiness, provided by the benzoin, a hint of aldehydes, and whatever other magical ingredients conjure “suede” in Keiko’s crock-pot. Cuir Cordoba is not a zoo leather, crawling with critters. There are no bestial whiffs here. Rather, it’s feminine, velvety; smoked honey dripping off a warm spoon. It’s the suede of a beloved glove, picking up traces of your favorite perfume -- and of your favorite hand to hold. Go to Nathan Branch's blog for more insights into Cuir Cordoba, including Nathan's PBS-style excursion into the history of Spanish leather. Learning is fun!